On 5th July, the High Court handed down its judgement on the judicial review brought by the JR4NHS claimants against the Secretary of State for Health & Social Care and NHS England on their introduction of Accountable Care Organisations (ACOs). We also now have the ruling on costs, read more below. NHS England has now launched the consultation extracted from the Department of Health and NHSE by our five JR4NHS claimants. They will consult on the contracting arrangements for Integrated Care Providers (ICPs), ‘formerly known as’ accountable care organisations (ACOs). We had originally brought our claim on four grounds – two on the lack of proper consultation, one on the legality of the idea itself, and one on grounds of lack of clarity and transparency. We withdrew our claim on the consultation grounds when our opponents conceded that they would not proceed without a full national consultation, so this success was in the bag. On legality – whilst making clear that he was not deciding on the merits of ACOs, and acknowledging that we raised “perfectly good and sensible questions…..about the ACO policy and the limitations of the terms and conditions in the draft ACO Contract” – Mr Justice Green decided that the ACO policy is lawful because the Health and Social Care Act 2012 gives very broad discretion to Clinical Commissioning Groups when commissioning services. For more about the judgment and the very favourable ruling on costs see here. … we had “acted in the public interest in bringing the claim and have identified some serious and important issues which will need to be considered during the course of the consultation, the substance of which will have been improved by the airing and ventilation of the Claimant’s concerns and criticisms”. November 2017 – notice served on Jeremy Hunt and NHS England of the four claimants intention to apply for judicial review (JR) to stop NHS England from introducing new commercial, non-NHS bodies to run health and social services without proper public consultation and without full Parliamentary scrutiny. 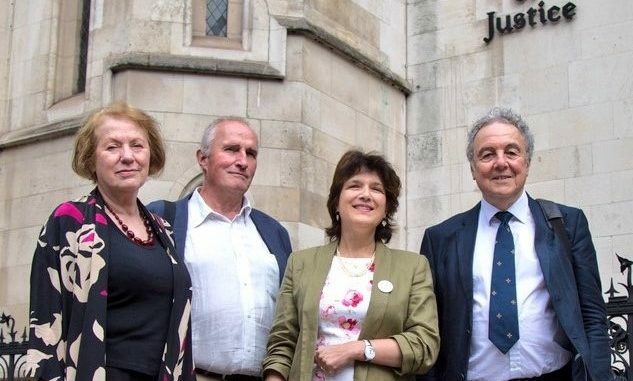 The four claimants launched their appeal fund on Crowdjustice. December 2017 – Professor Stephen Hawking joined Professor Allyson Pollock, Dr Colin Hutchinson, Professor Sue Richards and Dr Graham Winyard as ‘The Famous Five’ take on Government and NHSE. 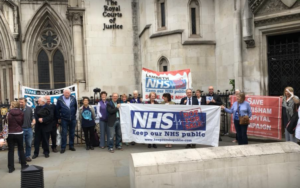 early February 2018 – The High Court judge ruled that the JR4NHS challenge met the ‘statutory test of public interest’ for a JR and the attempt by Hunt’s Department of Health and NHS England to impose a threat of punitive, uncapped costs was judged ‘not to be in the public interest’. NHSE changed terminology to try to downplay the toxic connection of ACOs to US health systems: accountable care systems (ACS) and organisations (ACO) were to be repackaged as integrated care systems and organisations with integrated care partnerships planning ‘voluntarily’ to prepare for these embedded organisational changes. Hunt had already agreed to a public consultation but insisted that he would go ahead with ‘secondary legislation’ as a work-around the primary legislation making his ACO contract illegal. Hunt reluctantly conceded that he would not ‘lay down’ statutory (secondary) legislation to allow use of the ACO model contract. By so doing, he was acknowledging the postponement of the introduction of first ACOs by 1st April – a setback to his and NHSE’s stated intention. Subsequently, NHSE announced that the public consultation would not take place until after the JR verdict. 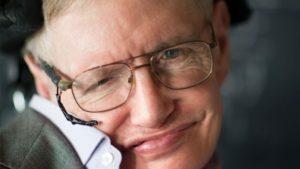 March 2018 – in the early hours of Wednesday 14 March came the very sad news of the death of Professor Stephen Hawking, the fifth of the claimants in the JR4NHS. May 2018 – as the days of the JR approached, 23-24 May, the four remaining JR4NHS claimants repeated their pledge to fight the JR, inspired by Professor Hawking’s determination to fight for the NHS to the very end of his life. There was great support for the JR4NHS team outside the Courts on both days and inside Court 76 where the drama unfolded. 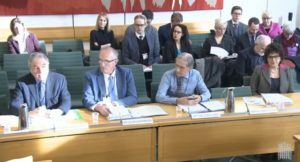 June 2018 – The awaited report of the Commons Health & Social Care Select Committee was published early June. It failed to make clear recommendations to stop ACOs or to oppose privatisation of hitherto NHS organisations. Nevertheless many of its recommendations gave implicit, though unattributed acknowledgment to the powerful evidence of campaigners, including the JR4NHS claimants at the Select Committee, in stating that primary legislation should be used if pilot ACOs were to be rolled out, and that ACOs, if pursued, should be explicitly NHS bodies. late June 2018 – responding to the dedication and success of campaigners, as the 70th anniversary of the NHS approaches, the Labour Party made one of its clearest commitments yet to halt privatisation and to return the NHS to its Bevanite founding vision, promising the drawing up of primary legislation to renationalise the NHS in readiness for a Labour government. July 2018 – on the 70th anniversary of the NHS the High Court handed down its judgement on the judicial review. The Court has found against the JR4NHS team on the law on the remaining two grounds. On legality – Mr Justice Green acknowledged that “perfectly good and sensible questions…..about the ACO policy and the limitations of the terms and conditions in the draft ACO Contract” were raised; but that the ACO policy was lawful because the Health and Social Care Act 2012 gives very broad discretion to Clinical Commissioning Groups when commissioning services. On clarity and transparency – he resoundingly rejected the Government’s argument that the principle did not apply “in relation to what by common accord is intended to amount to radical and transformational changes in the way in which health and social care is delivered”. However, he decided that the principle was not yet engaged because the consultation (extracted from Hunt) was still to come. 10 July 2018 – by now we have said goodbye to Jeremy Hunt, the much despised and longest lasting of Health secretaries, who has become Foreign Secretary. 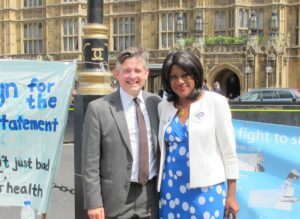 11 July 2018 – Eleanor Smith presented her 10-minute Rule bill on the NHS reinstatement in Parliament, whilst a rally of supporters gave this their vociferous backing outside. The bill passed this first reading unopposed and has been scheduled for its second reading Friday 26 October – we will monitor where it is placed on the agenda for that day. August 2018 – Mr Justice Green gave his very positive ruling on the costs of the JR4NHS challenge. See above. Sincere thanks and congratulations to Dr Colin Hutchinson, Professor Allyson Pollock, Professor Sue Richards, Dr Graham Winyard – and deep gratitude in sadness to Professor Stephen Hawking, his family and team. KONP, Health Campaigns Together and our allies are all are pledged to continue the campaign to reinstate the NHS fully in this its 70th year: ready to work with Labour in developing serious legislation to take back the NHS into public ownership and provision; ready with support for Eleanor Smith MP with her NHS Bill campaigning 10-minute bill (second reading 26 October). We are ready to up the campaign against the pernicious spread of wholly-owned subsidiary companies and integrated care systems up and down the land; and to demand that the Government change political course away from fragmentation, underfunding and privatisation of the NHS – soon to face another worrying winter for its staff striving to look after our population. Thanks to each of you & the late Professor Hawking, for leading our fight against the further privatisation of our National Health Service. Much has already been taken from us, but I will back your fight to stop what is left from being sold to the highest bidder. I hope that, in my lifetime, they will be forced to return their ill-gotten gains to the UK people.